Flying was formed in February, 1998. The first album �January Stars� was recorded in Kiev studio Unerase Records and was released in MC format in July, 1999 at Terroraiser Prod. Then came a wide promo-campaign in Ukrainian mass media and Flying gave more than twenty concerts in Ukraine and also Belarus. Common mini-tour with Gods Tower took place in March-April 1999, concerts in Kiev, Chernihiv and also appearance in Moscow Massacre Fest. In 2000 group started new songs creation. The second album �A Proud Bird� was recorded during autumn-spring 2001 Flying in (their own) home studio F-records. Audio-version on MC was released in September 2001 at Metalagen Records. In period of 2001-2002 Flying gave concerts with program �A Proud Bird� in cities of Ukraine and Byelarus. In May 2002 Flying was invited to Metalagen Fest. Later contract for re-releasing of album �A Proud Bird� in CD-format was signed with Soyuz Music. Remastering of the album was made by Yevgeniy Vinogradov (Die Records). In September 2002 release appeared at �Soyuz�. Album was represented in Germany at PopCom, 2002 and in France at Midem, 2003. It received a great number of positive reviews in magazines (�M� 10/10, �Terroraiser� 9/10, �Dark City� 4/5, �Fuzz� 4/5, �Painkiller� 4/5, �Rockor� 5/5, �In Rock� 7/10). Promo-broadcasting in metal-programs on TV and radio made possible to spread music over CIS. In March 2003 in Moscow Flying shared the stage with Cradle of Filth, in October in Kiev with Rotting Christ. In winter 2004 the renewed staff of Flying started the third album recording. Recording of �The Heir of the Future� took place in Kiev studio Zaglada, and mastering of the album again was made in Yevgeniy Vinogradov studio. On the first of March 2005 album was released at Metalagen Records/Soyuz Music. Reviews and points in metalmedia and internet-editions: �Legacy� 11/15, �Metalworks� 7/10, metal-archives.com 90/100, �Legion� 10/10, �Terroraiser� 10/10, froster.org 4,5/5, In Rock 9/10. During period 1998-2005 Flying played with: Gods Tower, Apocryphal, Znich, Unerase, Conquest, Te Deum, Grenouer, Mortem, Evthanaszia, Rasta, Forest Stream, Cradle of Filth, Rotting Christ, Master, Stormhold, Disentomb, Thelema, Zvik, Submind, Hard Way, As4del, Radigost, Misanthrope Count Merciful etc. In November The Inheritance Tour 2004-2005 to support the new album �The Heir of the Future� started with concerts in Gomel, Mozyr, Mogiljov, St.-Petersburg. In December 2005 before the appointed time group broke the contract with Metalagen Records/Soyuz Music and stopped its activity for some period of time to start new work in April 2006. May 30, 2006 albums �A Proud Bird� and �The Heir of the Future� were re-released at Moon Records special for Ukraine in re-mastering version with additional multimedia section. August 12, 2006 Flying played at MHM-Fest-VII (Yevpatoria, Ukraine) together with Holy Moses, Dead Infection, Infliction, Incarnated, Thy Disease, Mad V, Balfor (RU). October-November were the end of The Inheritance Tour through Ukraine with support of about 30 Ukrainian bands, among which the brightest metal-stage representatives were Mournful Gust, Mental Demise, Tessaract, Conquest. On the 1st of November the first album �January Stars�, which wasn�t released in CD format before, was released at Moon Records in re-mastering version with additional multimedia (three concert videos). 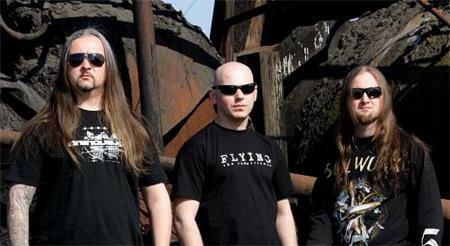 July 31, 2009 FLYING played at MHM FEST (Ukraine) together with Cryptopsy, Epitome, Banisher, Seth. Ect and others... 01/28/10 - fourth album �Graceful Murder� was released through Moon Records (Ukraine only). 2010 � Flying performed some shows in Ukraine, took part as a special guest in Gods Tower�s show in Kiev. Feb., 2011 � played as headliner at Jolly Roger Fest in Kiev (with W.Angel�s Conguest, Inferno, Te Deum). Spring, 2012 � released �Graceful Murder� album for the entire world by efforts of Total Metal Records (Ukraine) & More Hate Productions (Russia).